labelled with 1,1'-dioctadecyl-3,3,3,3'-tetramethyl-indocarbocyanine perchlorate [DilC18(3); Molecular Probes Inc.], an intra-vital membrane phospholipid-binding probe emitting under proper UV light excitation a bright orange-red fluorescence discernible with a rhodamine optical filter set. Next, ~106 HEKs suspended in 1 ml growth medium were seeded onto the surface of the SF 3D nonwovens opposite to that which had already been carrying the attached HDFs during the previous 10 days. The specimens were incubated at 37˚C for 3 h in an atmosphere of air with added CO2 5%v/v. Thereafter, the HDFs/HEKs-bearing nonwovens were transferred to a second multi-dish plate, dipped into 2 ml growth medium for the HEKs described and placed in the incubator at 37˚C in air 95%/CO2 5%v/v. Spent growth media were changed with fresh every 2-3 days and samples of the cellconditioned media were stored at -80˚C for further analysis. The co-cultured cells were examined under an inverted Zeiss IM35 microscope and photographed live with an Olympus 3300™ digital camera. 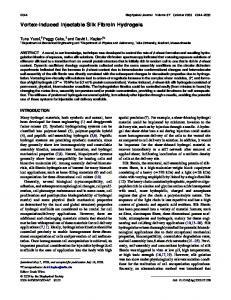 Deconvolved fluorescence images were obtained by using Huygens professional software for Windows (Scientific Volume Imaging b. v., Hilversun, The Netherlands). Metabolic studies. In the cell-conditioned growth medium samples, glucose uptake and lactate release were evaluated via glucose oxidase and lactate oxidase assays (Sigma), respectively, while L-glutamine uptake was assessed by the decrease in absorbance at 340 nm due to the oxidation of NADPH. The results were expressed as cumulative values in mg/ml of sample. The urea nitrogen content of cell-conditioned medium samples was assayed using the BUN (Endpoint) reagent (Sigma diagnostics procedure no. 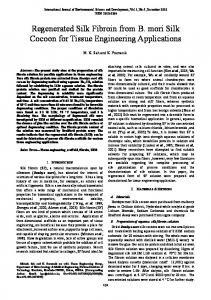 66-UV revised January 1995) for quantitative enzymatic determinations of urea nitrogen concentrations in serum or plasma at 340 nm according to the instructions of the seller. Figure 1. SEM photographs of 3D SF-based FA-crosslinked nonwovens. (a) Low magnification view of the surface showing the random arrangement of SF fibres. (b) Detail of the surface showing fibres stuck at crossovers and a thin film covering a void between adjacent fibres. 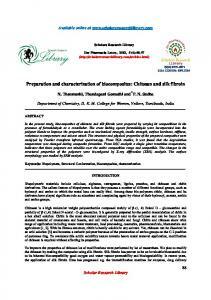 Release of proinflammatory IL-1ß by ELISA assay. A commercial ELISA kit was used to assay the content of human IL-1ß (CLB, Amsterdam, The Netherlands) in the conditioned co-culture media. The sensitivity of this assay was 0.8 pg/ml. Extracellular assembly of collagen fibres. The rate of type I collagen fibre assembly was assessed by an EIA method (Takara Shuzo Co., Japan) measuring the amount of Ctelopeptides released in the process from procollagen type-I molecules. The sensitivity of this assay was 10 ng/ml. Statistical analysis. The one-way analysis of co-variance was applied to sets of corresponding cell culture metabolism time-related data electing as the significance level P300˚C. (b) DSC curve of pure crystalline SF film (peak at 283˚C). (b) DSC curve of pure SF fibres (peak at 319˚C). Figure 4. Typical stress-strain curves of 3D SF-based FA-crosslinked nonwovens measured under dry (a) and wet (b) conditions. Figure 3. TGA curves of 3D SF-based FA-crosslinked nonwovens (a), of pure crystalline SF film (b), and of pure SF fibres (c). Onset of thermal degradation: (a) 289˚C; (b) 281˚C; and (c) 309˚C. initial weight loss due to the evaporation of moisture, 3D-SF nonwovens, SF films, and SF fibres entered a phase characterized by high thermal stability ranging from 100˚C until ~250˚C, during which the weight remained almost constant. This behaviour is characteristic of crystalline SF materials (25). Afterwards, the weight dropped sharply indicating the onset of extensive thermal degradation caused by SF burning. It is interesting to note that the TGA curve of 3D-SF nonwovens always ran between those of films and fibres, which denotes an intermediate thermal stability, with fibres showing the highest and films showing the lowest. Accordingly, the onset of thermal degradation occurred at increasing temperature values, i.e. at 281˚C, 289˚C, and 309˚C, from films to 3D-SF nonwoven and fibres, respectively. Typical stress-strain curves of 3D-SF nonwoven measured under dry and wet conditions are shown in Fig. 4 and results of tensile properties are summarized in Table I. It is important to note that the samples showed a reproducible and uniform mechanical behaviour under whole measuring conditions. 3D-SF nonwovens in the dry state exhibited a curve typical of a stiff material, with an initial region of high strain resistance, a yield point at ~5% elongation, and a final step of easier extensibility. Likewise for brittle and glassy materials, rupture occurred suddenly across the sample, as indicated by the sharp drop of the curve. The shape of the curve remarkably changed when the sample was preliminarily immersed into water at 37˚C and tested in the wet state. The initial slope decreased significantly, with a yield point falling at ~2% elongation, after which the sample entered a region characterized by plastic deformation. The change in slope of the stress-strain curve at ~17% elongation marked the onset of a strain-hardening step. Figure 5. Co-cultures of HEKs and HDFs on SF-based, FA-crosslinked 3D nonwovens after approximately 15 days of remaining in vitro. Prior to seeding HDFs were intra-vitally pre-labelled with DiOC18(3) fluorochrome (green fluorescence, whose intensity peaks at 590 nm wavelength, when excited by UV light. ), whereas HEKs were intra-vitally marked with DilC18(3) (red fluorescence peaking at 500 nm wavelength, when excited by UV light). Fluorescent micrographs were deconvolved as detailed in the Materials and methods in order to get rid of stray light and thus improve the sharpness of the pictures. (a) The not-too narrow-band FITC optical filter set used here allows observation of not only the HDFs, but even the HEKs, on the SF fibres and their overlapping at some places. (b) and (c) HEKs in clusters of various sizes have adhered to and grown on the SF fibres. The narrow-band rhodamine optical filter set used here does not allow observation of the concurrent presence of the HDFs in the same specimens. Original magnification, x100. Figure 6. Relevant metabolic activities like glucose consumption (left panel) and lactic acid release (right panel) are carried out steadily for lengthy terms by co-cultured HEKs and HDFs adhering to 3D SF-based FA-crosslinked nonwovens. The cumulative results shown here pertain to three distinct sets (AHKF-1, -2, and -3) of co-cultured HEKs and HDFs. For technical details consult the Materials and methods. Each point on the curves is the mean value of triplicate determinations. No significant statistical differences occur among the curves of each panel. The arrows indicate the time of HEKs seeding onto nonwovens that on the opposite site had been previously carrying HDFs stuck to their SF fibres. Figure 7. The extracellular assembly of novel collagen fibres occurs steadily for rather lengthy terms on the 3D SF-based FA-crosslinked nonwovens carrying co-cultured of HEKs and HDFs. The cumulative release of the Cpeptide of procollagen type-I was assayed as detailed in the Materials and methods. The results shown here pertain to three distinct sets (AHKF-1, -2, and -4) of human HEKs and HDFs. Each point on the curves is the mean value of triplicate determinations. The arrow indicates the time of HEKs seeding onto nonwovens that on their opposite site had been previously carrying HDFs stuck to their SF fibres. In one instance, i.e. the AHKF-4 coculture set, the sampling was carried out up to the 95th day in vitro; in the other two instances it was instead devised to terminate the co-cultures at the 65th day. (such as bone, cartilage, tendons, etc.). It also goes without saying that it will be necessary to optimise the structure of the 3D nonwovens according to the specific requirements of each likely site of application. Moreover, it will be essential to take heed of ongoing technological progress. Hopefully in a not so distant future, SF-based 3D nonwoven scaffolds made of microfibres or nanofibres (33-35) or both will suit quite different goals in the exciting fields of human tissue engineering, regeneration, and repair. Acknowledgements The authors wish to express their gratitude to Mr. Walter Carrer of Stazione Sperimentale per la Seta (Milan, Italy) for his contribution to the tensile measurements. References 1. Zhou CZ, Confalonieri F, Medina N, Zivanovic Y, Esuault C, Yang T, Jacquet M, Janin J, Duguet M, Perasso R and Li ZG: Fine organization of Bombyx mori fibroin heavy chain gene. Nucleic Acids Res 28: 2413-2419, 2000. 2. Soong HK and Kenyon KR: Adverse reactions to virgin silk sutures in cataract surgery. Ophthalmology 91: 479-483, 1984. 3. Wen CM, Ye ST, Zhou LX and Yu Y: Silk-induced asthma in children: a report of 64 cases. Ann Allergy 65: 375-378, 1990. 4. 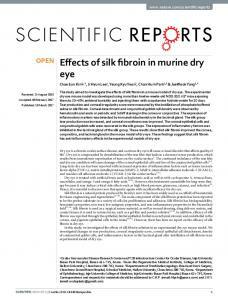 Kurosaki S, Otsuka H, Kunitomo M, Koyama M, Pawankar R and Matumoto K: Fibroin allergy: IgE mediated hypersensitivity to silk suture materials. Nippon Ika Daigaku Zasshi 66: 41-44, 1999. 5. Rossitch E Jr, Bullard DE and Oakes WJ: Delayed foreign-body response to silk sutures in pediatric neurosurgical patients. Childs Nerv Syst 3: 375-378, 1987. 6. 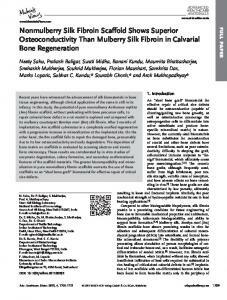 Setzen G and Williams EF: Tissue response to suture materials implanted subcutaneously in a rabbit model. Plast Reconstruct Surg 100: 1788-1795, 1997. 7. Nebel L, Rosenberg G, Tobias B and Nathan H: Autograft suture in peripheral nerves. Eur Surg Res 9: 224-234, 1977. 8. 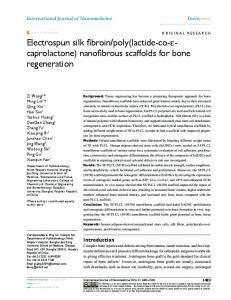 Sakabe H, Ito H, Miyamoto T, Noishiki Y and Ha WS: In vivo blood compatibility of regenerated silk fibroin. Sen-I Gakkaishi 45: 487-490, 1989. 9. 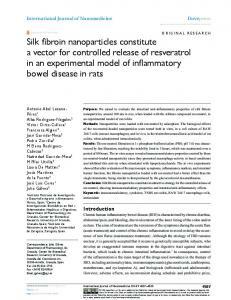 Santin M, Motta A, Freddi G and Cannas M: In vitro evaluation of the inflammatory potential of the silk fibroin. J Biomed Mater Res 46: 382-389, 1999. 10. 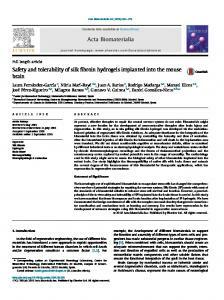 Chiarini A, Petrini P, Bozzini S, Dal Pra I and Armato U: Silk fibroin/poly(carbonate)-urethane as a substrate for cell growth: in vivo interactions with human cells. 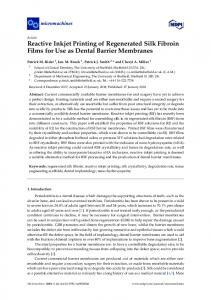 Biomaterials 24: 789-799, 2003. 11. Dal Pra I, Petrini P, Chiarini A, Bozzini S, Fare S and Armato U: Silk fibroin-coated three-dimensional polyurethane scaffolds for tissue engineering: interactions with normal human fibroblasts. Tissue Eng 9: 1113-1121, 2003. 12. Minoura N, Tsukada M and Nagura M: Physico-chemical properties of silk fibroin membrane as a biomaterial. Biomaterials 11: 430-434, 1990. 13. Minoura N, Aiba S, Gotoh Y, Tsukada M and Imai Y: Attachment and growth of cultured fibroblast cells on silk protein matrices. J Biomed Mater Res 29: 1215-1221, 1995. 14. Gotoh Y, Tsukada M and Minoura N: Effect of the chemical modification of the arginyl residue in Bombyx mori silk fibroin on the attachment and growth of fibroblast cells. J Biomed Mater Res 39: 351-357, 1998. 15. Inouye K, Kurokawa M, Nishikawa S and Tsukada M: Use of Bombyx mori silk fibroin as a substratum for cultivation of animal cells. J Biochem Biophys Methods 37: 159-164, 1998. 16. Norihiko M, Sei-ichi A, Yohko G, Masuhiro T and Yohji I: Attachment and growth of cultured fibroblast cells on silk fibroin matrices. J Biomed Mater Res 29: 1215-1221, 1995. 17. Armato U, Migliaresi C and Motta A: Bio-artificial substrate for the production of animal and, in particular, human tissue and organs. Patent PTC WO 01/25403 A3, published September 28, 2001. 18. 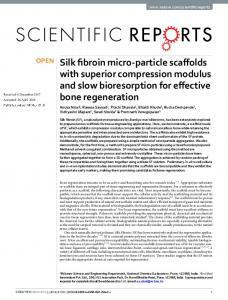 Sofia S, McCarthy MB, Gronowicz G and Kaplan DL: Functionalized silk-based biomaterials for bone formation. J Biomed Mater Res 54: 139-148, 2001. 19. 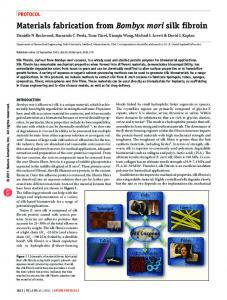 Altman GH, Diaz F, Jakuba C, Calabro T, Horan RL, Chen J, Lu H, Richmond J and Kaplan DL: Silk-based biomaterials. Biomaterials 24: 401-416, 2003. 20. Dal Pra I, Freddi G, Minic J, Chiarini A and Armato U: De novo engineering of reticular connective tissue in vivo by silk fibroin nonwoven materials. Biomaterials 26: 1987-1999, 2005. 21. 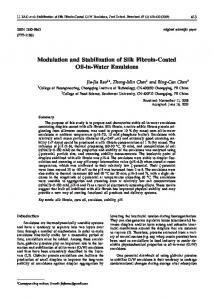 Armato U, Dal Pra I, Kesenci K, Migliaresi C and Motta A: Method for the preparation of non-woven silk fibroin fabrics. Patent PTC WO 02/29141 A1, published April 11, 2002. 22. Earland C and Raven JR: A new solvent for silk. Nature 44: 461, 1954. 23. Asakura T, Yao J, Yamane T, Umemura K and Ulrich AS: Heterogeneous structure of silk fibres from Bombyx mori resolved by 13C solid-state NMR spectroscopy. J Am Chem Soc 124: 8794-8795, 2002. 24. Arai T, Freddi G, Innocenti R and Tsukada M: Preparation of water repellent silks by a reaction with octadecenylsuccinic anhydride. J Appl Polym Sci 89: 324-332, 2003. 25. Lee SM, Cho DH, Park WH, Lee SG, Han SO and Drzal LT: Novel silk/poly(butylenes succinate) biocomposites: the effect of short fibre on their mechanical and thermal properties. Compos Sci Technol 65: 647-657, 2005. 26. Minoura M, Tsukada M and Nagura M: Physico-chemical properties of silk fibroin membrane as a biomaterial. Biomaterials 11: 430-434, 1990. 27. Perez-Rigueiro J, Viney C, Llorca J and Elices M: Mechanical properties of single-brim silkworm silk. J Appl Polym Sci 75: 1270-1277, 2000. 28. 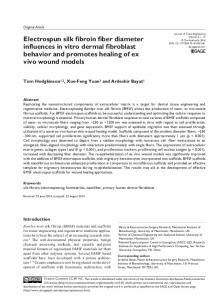 Duncan MR and Berman B: Stimulation of collagen and glycosaminoglycan production in cultured human adult dermal fibroblasts by recombinant human interleukin-6. J Invest Dermatol 97: 686-692, 1991. 29. Konig A and Bruckner-Tuderman L: Transforming growth factor-beta promotes deposition of collagen VII in a modified organotypic skin model. Lab Invest 70: 203-209, 1994. 30. Dubertret L: Reconstruction of the human skin equivalent in vitro: a new tool for skin biology. Skin Pharmacol 3: 144-148, 1990. 31. Shahabeddin L, Berthod F, Damour O and Collombel C: Characterization of skin reconstructed on a chitosan-cross-linked collagen-glycosaminoglycan matrix. Skin Pharmacol 3: 107-114, 1990. 32. Tinois E, Faure M, Chatelain P, Vallier P and Schmitt D: Growth and differentiation of human keratinocytes on extracellular matrix. Arch Dermatol Res 279: 241-246, 1987. 33. Altman GH, Horal RL, Lu HH, Moreau J, Martin I, Richmond JC and Kaplan DL: Silk matrix for tissue engineered anterior cruciate ligaments. 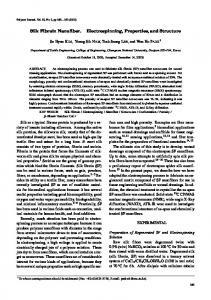 Biomaterials 23: 4131-4141, 2002. 34. 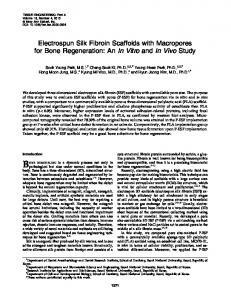 Jin H-J, Chen J, Karageorgiou V, Altman GH and Kaplan DL: Human bone marrow stromal cells responses on electrospun silk fibroin mats. Biomaterials 25: 1039-1047, 2004. 35. 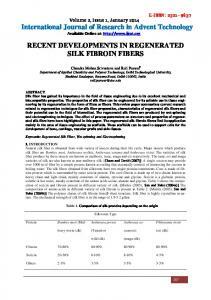 Min B-M, Lee G, Kim SH, Nam YS, Lee TS and Park WH: Electrospinning of silk fibroin nanofibers and its effect on the adhesion and spreading of normal human keratinocytes and fibroblasts in vitro. 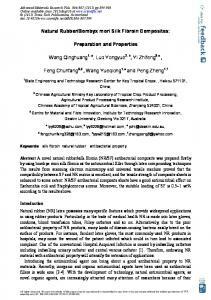 Biomaterials 25: 1289-1297, 2004. 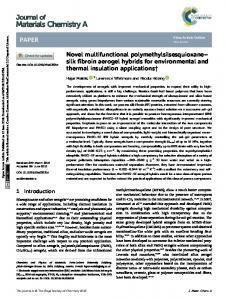 Report "Novel dermo-epidermal equivalents on silk fibroin ... - Semantic Scholar"